Bulgin has released a slimline series of photoelectric sensors as the first part of its new upcoming automation sensor range. Created especially for manufacturing and industrial automation proximity sensing operations, the SL Series sensors provide manufacturers with a flexible and cost-effective solution for the implementation of the IIoT. 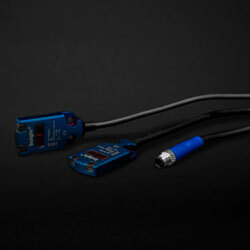 The sensor interface converts a photonic input to a digital or analogue output. It can be utilised to detect distance, presence or absence of an object employing a light transmitter and a photoelectric receiver, providing a typical light point diameter of 5mm at 30mm. The diffuse reflective sensor can be employed to detect objects from 1mm to 40mm away with a response time of less than 0.5ms. With the body of the sensor measuring just 30mm x 16mm x 4.5mm, the simple, slim and efficient design saves precious space on the assembly line. The series provides a waterproof and dustproof seal to any standard M5 interface, plus a high degree of mechanical and electrical stability. The IP67-rated sensors are constructed with highly robust casing stainless steel 316 material and can endure a high degree of physical impact. They are vibration tested to 10-50Hz double amplitudes (X, Y and Z in each direction for two hours) and shock and bump tested to 1000m/s² (X, Y & Z in each direction six times). The series is offered with or without an M5 connector, and the cables are 2m in length. Both NPN and PNP output options are available.